Everyone needs a second chance…including Coldplay. Three years ago the band played the Clark County Amphitheater and it was clear that large, outdoor amphitheaters are not a fit with this band. It was a lackluster performance, to put it mildly, and by the third song I sat down from boredom. Coldplay’s intimate songs demand an intimate venue but perhaps by the time they got around to the Pacific Northwest they were bored too. But on Tuesday at the Rose Garden in Portland, singer Chris Martin was sweating through his shirt by the third song providing proof to his comments that unless he’s sweating he’s not giving the audience his best. 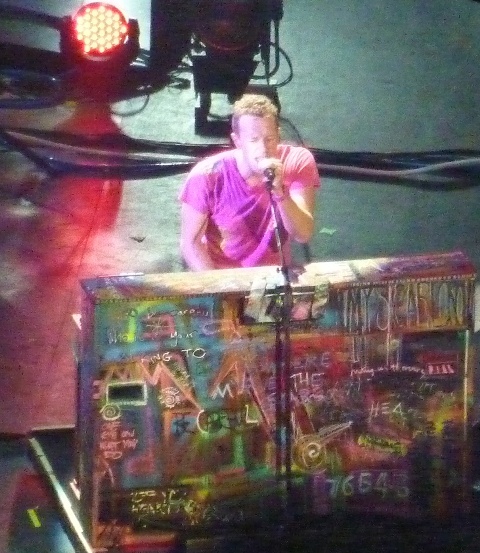 Coldplay not only gave their best, the show was one of most memorable concerts I’ve been too. These guys are a legitimate rock band. 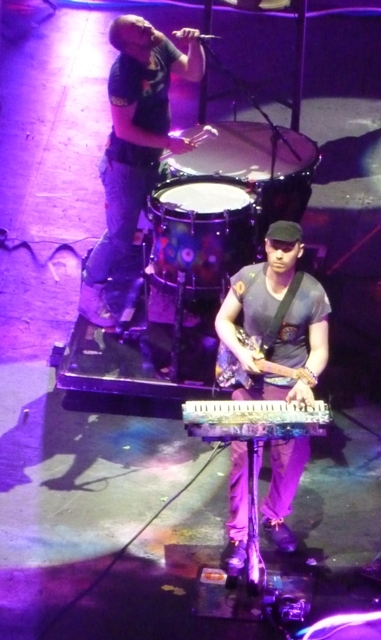 Forget the rain of confetti, the bouncing beach balls and the dazzling light show that incorporated blinking wrist bands given to the audience, Martin, guitarist Jonny Buckland, bassist Guy Berryman and drummer Will Champion played a tight set that proved why they are one of the world’s best-selling acts. Whatever criticism is laid on the band be it the whiny songs, the overly slow and sad songs, and similar sounding songs, the genius behind Coldplay is they know how to tap into the brain’s emotional center more than any top selling band today. From the melancholy, “Warning Sign,” to the gut-wrencher, “Fix You,” to the crowd pleaser “Paradise” Coldplay’s songs backed by Martin’s intensity can make you sit and reflect on a lost love or ponder the excitement of the future. Coldplay’s sound can be directly attributed to Buckland’s guitar playing which helps fit the band in nearly its own genre just like what The Edge does for U2 and Alex Lifeson does for Rush. And, Champion is far from a one-two puncher time keeper behind the drums. Watching him pound the sticks is just as entertaining as Martin’s twirling and running about. The overhyped Viva La Vida (it certainly didn’t help when Martin claimed it to be the greatest piece of music ever – it wasn’t) may have sold better, thus far, than Mylo Xyloto, the album the band is currently touring, but Mylo shows a gradual shift towards a more upbeat approach and is a far superior album than Viva. The album is much stronger as a whole and production wise each song has its own flavor. Paradise brought the entire audience, even those in the rafters, to their feet and no one sat down until the show was over four songs later. The band performed 10 of the 14 songs from Mylo. What clearly is not lost on Coldplay is the adoration of its fans. Martin thanked the crowd no less than three times for spending their money and their time on a Tuesday to see the band. The Coldplay faithful would likely brave any conditions to see their heroes but Martin’s comments were far from self-indulgent. The world is living in trying times and concert tickets are not cheap. With a nod to this fact Martin promised to deliver a worthy show. Well written. Thanks! I am attending their concert in DC a few weeks from now. Super excited!